V(D)J rearrangements occur within loci of TCR and BCR genes, thus generating the diversity of the AgR repertoire. In addition, interlocus V(D)J rearrangements occur, giving rise to so-called “trans-rearrangements.” Such trans-rearrangements increase the diversity of the immune receptor repertoire and can be expressed as functional chimeric TCR proteins on the surface of T cells. Although chimeric receptors are not pathogenic per se, the frequency of AgR trans-rearrangements correlates with the level of genetic instability and thus could be used as a predictive biomarker for lymphoma risk. B cell receptor and TCR Ag-recognition polypeptide chains are encoded by sets of gene segments instead of single contiguous DNA sequences (1, 2). They consist of variable (V), diversity (D), and joining (J) gene clusters, and one gene out of each segment is selected to form V(D)J rearrangements (3). The recombination-activating proteins RAG1 and RAG2 orchestrate this process (4). Different B or T cells rearrange a different segment in each pool, thereby creating one level of AgR diversity. Moreover, the enzyme TdT incorporates nontemplate (N) nucleotides to the ends of V, D, and J gene segments before their joining (5). These inserted non-germline-encoded nucleotides at V(D)J junctions provide additional somatic diversification of the available germline repertoire. Thus, V(D)J recombination endows B and T lymphocytes with the capacity to specifically recognize an almost infinite array of Ags. The aforementioned V(D)J recombination occurs within the AgR loci (intralocus rearrangement). Strikingly, such rearrangements can also occur between two different loci (interlocus rearrangements or trans-rearrangements) (6, 7, 8, 9, 10). Aberrant interchromosomal V(D)J recombinations are physiologically prevented by several surveillance mechanisms (11, 12). Nevertheless, trans-rearrangements occasionally arise by mechanisms, including gene conversion and recombination and subsequent reintegration of excision products from prior cis-rearrangements (13). However, genetic evidence indicates that trans-rearrangements usually result from chromosomal translocation or inversion that occur at a very low frequency in TCR and even more rarely in BCR loci (6, 10, 13, 14). For example, Vδ-Jγ trans-rearrangements have been calculated to occur in PBL at a frequency of 1/200,000 (10). Human chromosome 7 carries the TCRβ genes at one end, whereas the TCRγ locus lies at the opposite end (Fig. 1⇓). An inversion of this chromosome juxtaposes Vγ genes to β-chain gene segments ((Dβ)JβCβ) at one chromosomal end) and Vβ(Dβ) genes to JγCγ at the opposite end (6, 15). This results in a rearrangement of β genes with gene segments of the γ chain. Accordingly, an interlocus instead of intralocus rearrangement and hence a trans-rearrangement instead of a conventional rearrangement occurs (Fig. 1⇓). Depending on the locus of inversion and re-ligation of the respective chromosome, various kinds of trans-rearranged TCR genes arise. Another example of such trans-rearrangements is an inversion of chromosome 14 in tumor cells of patients with childhood acute lymphoblastic leukemia of B cell lineage (7, 16, 17). This inversion creates a site-specific recombination event between an Ig H chain variable gene (IgVH) and the joining segment of a TCRα chain (TCRJα). Consequently, this event results in the generation of a hybrid gene, partly Ig and partly TCR (IgVH-TCRJα trans-rearrangement). Other types of hybrid transcripts were generated by splicing of an already rearranged TCRVγ-Jγ exon to the TCRβ constant region (trans-splicing) (6). Sequence analysis suggested that these trans-rearrangements arise through the action of normal lymphocyte recombinase, involve trans-recognition of heptamer/nonamer recombination signals, and follow the 12/23 spacer rule (10, 17). Additions of N nucleotides are frequently detected in trans-rearranged receptor genes (9, 10). These hybrid genes were transcribed into mRNA. Strikingly, sequence analysis of these mRNA showed that they generally contain a complete open reading frame and are translated into a chimeric protein displayed on the cell surface (8, 9, 10). Schematic illustration of the generation of TCR trans-rearrangement by inversion of chromosome 7. The inversion brings VβDβ close to JγCγ and Vγ close to JβCβ resulting in Vγ-Cβ and Vβ-Cγ TCR trans-rearrangements. Known chromosomal abnormalities related to the trans-rearrangements are inversions involving chromosomes 7 and 14 (6, 7). Accordingly, the breakpoints of these rearrangements are located in bands 14q12, 7q35, 7q14, and 14q32 for TCR and Ig genes, respectively (18). These generate diverse kinds of trans-rearrangements such as Vγ-Jβ, Vβ-Jγ, Vδ-Jβ, Vδ-Jγ, and Vγ-Jδ, (10, 17, 19, 20, 21). Exposure of cryptic recombination signal sequence on partner chromosomes may mislead RAG proteins to rearrange interallelic gene segments (19). Nevertheless, the consistent participation of AgR loci in chromosomal translocations in lymphoma patients suggests that components of the V(D)J recombinase may participate in creating conditions for aberrant chromosomal joining (22, 23, 24) and thereby trans-rearrangements. The rejoining of V(D)J-recombination intermediates, as well as the repair of double strand breaks, induced by exogenous DNA-damaging agents such as ionizing radiation occur mainly by nonhomologous end joining in G1 cells in vertebrates (25). A mutation of components required for nonhomologous end joining was found to increase the V(D)J intergenic recombination (26). Thus, in mice lacking a functional DNA-protein kinase C, cells with a high level of unresolved coding ends and signal ends are generated (27, 28). In fact, Tevelev and Schatz (29) reported that recombination intermediates, if not joined or kept in a synaptic complex, could potentially be misjoined to any available ends. Moreover, secondary rearrangements (e.g., from Vγ to Jβ) were blocked in normal individuals but not in patients with ataxia telangiectasia (AT)2 (30), a disorder with increased rates of TCR trans-rearrangements (10, 15). AT patients have a homozygous mutation in the ataxia telangiectasia-mutated (ATM) gene, which codes for a serine-threonine protein kinase that phosphorylates Mre11 and NBS1 (Nijmegen breakage syndrome protein) and is required for the repair of DNA breaks and for V(D)J recombination (31, 32, 33, 34). A mutation in ATM causes chromosomal instabilities and predisposes to the development of lymphoid malignancy in AT patients and in ATM-deficient mice and mice homozygous for Mre11 and NBS1 hypomorphic alleles (35, 36, 37, 38). TCR trans-rearrangements occur at a very low frequency (in the order of 1/200,000 PBL) in normal individuals (9, 10). However, 50- to 100-fold increased frequencies are observed in pathological conditions with higher chromosomal instabilities such as AT (10, 15) and lymphoid leukemias (7, 20). Intriguingly, the frequency of TCR trans-rearrangements can rapidly increase in some situations. Several fold increases in the frequency of trans-rearrangements were seen in patients undergoing chemotherapy for the treatment of lymphomas, leukemias, or solid tumors (39, 40). This increase was transient and returned to the basal level after cessation of chemotherapy. TCR trans-rearrangements have also been studied in mice models. In the SCID mouse, a marked increase in trans-rearrangements compared with BALB/c mice was observed (41, 42). The inability of SCID cells to promptly resolve their recombination ends seems to expose the ends to a random joining process and consequently to increase the trans-rearrangement levels (43, 44, 45). In line with similar observations in patients during radiation therapy, trans-rearrangement levels were also raised 50- to 100-fold by irradiation of mice (45). Genomic instabilities are the hallmark of most tumors and are believed to be a prerequisite for tumorigenesis (46). Beside the hereditary factor, external events such as exposure to hazardous chemicals or ionizing radiation may induce genomic instability (47, 48), which is correlated with the frequency of trans-rearrangements. The frequency of Vγ-Jβ trans-rearrangements was 1:30,000 in PBL, and in parallel to this, the inversion in chromosome 7 was ∼1:10,000 in T cells (49, 50). Furthermore, in mice, the ratio of cis- to trans-rearrangements is 500-1000:1 in normal cells (45). However, in thymocytes from irradiated SCID mice, this ratio is increased to ∼6:1 (51). Thus, the assessment of the frequency of trans-rearrangements provides a measure of genetic instability. Studies on a group of agricultural workers from southern Minnesota and northern Iowa (cancer victims’ area) indicated that the frequency of trans-rearrangements was correlated with the exposure to cancer-promoting chemicals such as herbicides, pesticides, and fumigants. In this group, a 15- to 30-fold increased frequency of trans-rearrangements was observed (52). Moreover, when newborn SCID mice were irradiated, all animals developed thymic lymphomas by 20 wk of age (51). Within 2 wk of irradiation, a 50- to 100-fold increase in TCR trans-rearrangements (notably Vγ-Cβ) was observed. In accordance with this study, several other studies in humans, including ours, have indicated that the rate of Vγ-Cβ trans-rearrangements is a suitable indicator for genetic instability (9, 51). Thus, it appears that in situations where prediction of cancer is high, TCR trans-rearrangements are increased in parallel with the occurrence of genomic abnormalities and a long time before the diagnosis of cancer is made. This suggests that the measurement of the frequency of trans-rearranged TCR genes in PBL might be a sensitive assay to determine the predisposition to cancer if other reasons for transient increases, such as ongoing chemotherapy, exposure to environmental agents, or irradiation, are excluded (51). Sequence analysis of trans-rearranged transcripts showed that they generally maintained a correct open reading frame at the V-J junction, and the hybrid V-J exon was correctly spliced to a TCR constant region, thus allowing translation into a functional AgR chain (8, 9, 10). This hybrid chain was able to pair with intralocally rearranged TCR chains. For example, the hybrid TCR Vγ-Cβ chains were paired to TCR Vα-Cα chains (8). Trans-rearranged chimeric TCR still recognize antigenic peptides within the MHC grooves and are functionally similar to classically rearranged receptors. Cell lines with different types of trans-rearranged TCR have been generated (8). Functional analysis of such T cell lines revealed strong proliferative or cytotoxic responses toward allogeneic cells (Fig. 2⇓). Together with the presence of CD3 and either CD4 or CD8 coreceptors on most of the T cell clones (8, 9), these results suggest that ligands recognized by trans-rearranged TCR are very similar to those recognized by conventional T cells. In addition to previously defined VγI family-Cβ trans-rearrangements (8), we identified and characterized Vγ-Cβ trans-rearrangements involving the most frequent Vγ gene in human peripheral blood, i.e., Vγ9 (the single VγII family member) (9). T cells carrying the chimeric Vγ9-Cβ receptor chains responded to stimulation with mAb against Vγ9 and Cβ by proliferation and secretion of TNF-α and IFN-γ. While Meydan et al. (53) observed a clonal expansion of such T cells carrying trans-rearranged TCR, our own lines were oligo/polyclonal in nature based on PCR and flow cytometric analysis (8, 9). Given that alloreactivity is a proven characteristic of αβ and not of γδ T cells, cells expressing trans-rearranged TCR are not only phenotypically but also functionally similar to αβ T cells. The observed alloreactivity (8) indicates that conventionally rearranged and trans-rearranged TCR induce similar cellular responses and presumably similar signaling pathways. There are several implications with respect to the process of TCR selection and the structural relationship between αβ and γδ TCR. Because most γδ T cells are CD4−CD8− and are not alloreactive, this would indicate that the same Vγ gene could participate in the recognition of distinct sets of ligands depending on the TCR chain with which it associates. Furthermore, the trans-rearrangement model suggests a close structural relationship between Vγ and Vβ regions, an assumption that is also supported by the fact that both V regions display superantigen reactivity (54, 55), unlike Vα and Vδ regions. Finally, these studies suggest that TCR alloreactivity is determined by the repertoire selection process operating during lymphocyte development rather than by structural features specific to Vα/Vβ regions. T cells harboring TCR trans-rearrangements can express functional chimeric TCR proteins on the cell surface. Left, Conventional αβTCR with β-chain consisting of rearranged VβDβJβCβ genes. Right, chimeric αβTCR with β-chain consisting of Vγ rearranged to (Dβ)JβCβ. T cells expressing chimeric TCR respond to antigenic or anti-TCR mAb stimulation like conventional T cells with cytotoxic effector activity, cytokine production, and proliferation. While many kinds of trans-rearrangements are detected, trans-rearrangements between the TCRγ and TCRβ loci are the most abundant (45). Early studies reported that both Vγ-Jγ and Dβ-Jβ occur simultaneously (23, 25), which gives rise to more opportunities for this kind of trans-rearrangement to take place. Table I⇓ lists the described TCR trans-rearrangements. 1) Trans-rearrangements as a possible compensation mechanism. Strikingly, the frequency of trans-rearrangements increases in pathological situations, exhibiting a marked deficiency in lymphocytes number and/or function (9). For instance, while AT patients have a skewed TCR repertoire and a marked decrease in thymic output (56), a high frequency of TCR trans-rearrangements has been observed (6, 9, 15). Furthermore, TCR trans-rearrangements were raised under stressful conditions such as exposure to irradiation or to hazardous chemicals where immune system dysfunctions were observed (47, 48, 52). Taken together, this raises the possibility that the increased occurrence of (functional) trans-rearranged receptors helps to broaden the TCR repertoire in situations of skewed immune responses. However, it remains to be determined how these cells function in vivo. Functional assays such as an adoptive transfer into SCID- or RAG2-deficient mice might help to elucidate this point. 2) Cells expressing trans-rearranged TCR may undergo negative selection. The intrathymic differentiation differs in developing αβ and γδ T cells. While γδ T cells remain mainly CD8−CD4−, αβ T cells develop from CD8+CD4+ double-positive (DP) intermediates. Thus, it is possible that cells with trans-rearranged TCR are generated from CD8+CD4+ DP thymocytes. Consequently, they would be examined by self-peptide-MHC complexes to become committed to either CD8 or CD4 single-positive T cells. The fact that CD4 and CD8 expression is induced after either VβDβJβCβ or Vγ(Dβ)JβCβ rearrangement within the precursor cell would indicate that transition to the DP stage is primarily dictated by the locus of origin of the constant rather than the variable part of the rearranged gene, which is in accordance with earlier observations made by others (57). Cells with trans-rearranged TCR show a distinctive distribution in the mouse depending on the type of trans-rearrangement. T cells with trans-rearranged Vγ-Jδ, Vδ-Jγ, and Vγ-Jβ are present in the thymus and considerably less in other organs, whereas Vδ-Jβ and IgVH-Jδ are detected only in the thymus (10). This pattern of distribution indicates that these cells undergo a negative selection in thymus. Potential reasons for the negative selection might include the conformation of the trans-rearranged receptor, rendering it incapable of detecting the architecture of self-MHC-bound self-peptide. Consequently, such receptors would be unable to receive a life signal and therefore would undergo death by neglect. Another possibility is that these cells undergo apoptosis since thymic output is extremely low in patients with a high frequency of trans-rearrangements, as well as in SCID mice (58, 59). 3) Trans-rearrangements increase the diversity of the immune receptor repertoire. Since a small yet significant fraction of PBL express trans-rearranged TCR chains on their surface in all individuals (8, 9), it is obvious that trans-rearrangements contribute to the combinatorial diversification of the immune system repertoire. Sequence analysis of Vγ chains shows that the joining of a Vγ gene segment to a D gene segment is unusual in cis-rearrangements since TCRγ does not have D segments (10). Strikingly, Vγ has been trans-rearranged to D gene segments of δ and β chains. This further illustrates the role of trans-rearrangements in increasing the diversity of the immune receptor repertoire. Furthermore, sequence analysis of Vδ-Jβ trans-rearrangements showed many variations in D gene segment assembly. While in cis-rearrangements a rearranged D gene segment was flanked by N regions, in some trans-rearranged receptors only one N region nucleotide was added (Table I⇑). Remarkably, Tycko et al. (23) observed constraints on recombination within the TCR locus that prevented Vγ5-Jγ2 rearrangements while allowing rearrangements in trans. Taken together, the mechanism of trans-rearrangement adds more diversity to the AgR repertoire. 4) The trans-rearrangement paradigm is in accordance with the αβ and γδ TCR gene rearrangement model. The commitment to the αβ or γδ lineage in the thymus is not fully understood (60). One model postulates that γ and δ loci are fully rearranged, whereas at the same time the β locus is partially rearranged (D-J). If the γ and δ genes are not successfully rearranged, the rearrangement of β will continue, and the α chain will start to rearrange (61). The trans-rearrangement phenomenon sheds some light on which kind of genes are simultaneously available for the rearrangements. While γ, δ, and β hybrids are found, Vα trans-rearrangements have as yet not been detected. Remarkably, Jα gene segments have been detected in trans-rearranged receptors (10). Together, the trans-rearrangement study shows that precisely the Vα and not the entire α gene regions are still not available to rearrange at the time when the rest of TCR gene segments are. We hypothesize that a specific mechanism is required to open the chromatin region of Vα, an assumption that requires further investigation. Many studies showed that rearrangements can occur between different genes of TCR and BCR, thereby generating V(D)J trans-rearrangements. Such trans-rearrangements increase the diversity of the immune receptor repertoire. The trans-rearranged chimeric TCR displayed on the cell surface exert alloreactivity and respond to selective stimuli by cytokine production. Furthermore, trans-rearrangements are potentially “benevolent” errors in the immune system and might serve as a good marker for genomic instability and can be viewed as a readily available baseline measure to predict predisposition to lymphoma development. 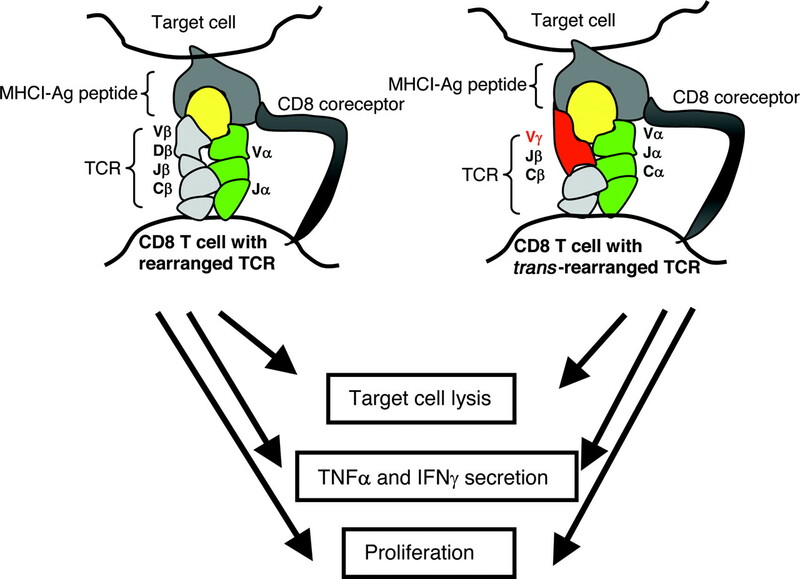 Adoptive transfer experiments will further elucidate the function of T cells expressing chimeric TCR in the immune defense in in vivo settings. ↵2 Abbreviations used in this paper: AT, ataxia telangiectasia; ATM, ataxia telangiectasia mutated; DP, double positive. Kurosawa, Y., H. von Boehmer, W. Haas, H. Sakano, A. Trauneker, S. Tonegawa. 1981. Identification of D segments of immunoglobulin heavy-chain genes and their rearrangement in T lymphocytes. Nature 290: 565-570. Tonegawa, S.. 1983. Somatic generation of antibody diversity. Nature 302: 575-581. Alt, F. W., T. K. Blackwell, G. D. Yancopoulos. 1987. Development of the primary antibody repertoire. Science 238: 1079-1087. Oettinger, M. A., D. G. Schatz, C. Gorka, D. Baltimore. 1990. RAG-1 and RAG-2, adjacent genes that synergistically activate V(D)J recombination. Science 248: 1517-1523. Davis, M. M., P. J. Bjorkman. 1988. T cell antigen receptor genes and T cell recognition. Nature 334: 395-402. Lipkowitz, S., M. H. Stern, I. R. Kirsch. 1990. Hybrid T cell receptor genes formed by interlocus recombination in normal and ataxia-telangiectasis lymphocytes. J. Exp. Med. 172: 409-418. Denny, C. T., Y. Yoshikai, T. W. Mak, S. D. Smith, G. F. Hollis, I. R. Kirsch. 1986. A chromosome 14 inversion in a T cell lymphoma is caused by site-specific recombination between immunoglobulin and T cell receptor loci. Nature 320: 549-551. Davodeau, F., M. A. Peyrat, J. Gaschet, M. M. Hallet, F. Triebel, H. Vié, D. Kabelitz, M. Bonneville. 1994. Surface expression of functional T cell receptor chains formed by interlocus recombination on human T lymphocytes. J. Exp. Med. 180: 1685-1691. Hinz, T., A. Allam, D. Wesch, D. Schindler, D. Kabelitz. 2000. Cell-surface expression of transrearranged Vγ-Cβ T cell receptor chains in healthy donors and in ataxia telangiectasia patients. Br. J. Haematol. 109: 201-210. Kobayashi, Y., B. Tycko, A. L. Soreng, J. Sklar. 1991. Transrearrangements between antigen receptor genes in normal human lymphoid tissues and in ataxia telangiectasia. J. Immunol. 147: 3201-3209. Han, J. O., S. B. Steen, D. B. Roth. 1999. Intermolecular V(D)J recombination is prohibited specifically at the joining step. Mol. Cell 3: 331-338. Tillman, R. E., A. L. Wooley, M. M. Highes, T. D. Wehrly, W. Swat, B. P. Sleckman. 2002. Restrictions limiting the generation of DNA double strand breaks during chromosomal V(D)J recombination. J. Exp. Med. 195: 309-316. Denny, C. T., G. F. Hollis, F. Hecht, R. Morgan, M. P. Link, S. D. Smith, I. R. Kirsch. 1986. Common mechanism of chromosome inversion in B and T cell tumors: relevance to lymphoid development. Science 234: 197-200. Lewis, S. M.. 1994. The mechanism of V(D)J joining: lessons from molecular, immunological, and comparative analyses. Adv. Immunol. 56: 27-150. Stern, M. H., S. Lipkowitz, A. Aurias, C. Griscelli, G. Thomas, I. R. Kirsch. 1989. Inversion of chromosome 7 in ataxia telangiectasia is generated by a rearrangement between T cell receptor β and T cell receptor γ genes. Blood 74: 2076-2080. Baer, R., K. C. Chen, S. D. Smith, T. H. Rabbitts. 1985. Fusion of an immunoglobulin variable gene and a T cell receptor constant gene in the chromosome 14 inversion associated with T cell tumors. Cell 43: 705-713. Bernard, O., M. Groettrup, F. Mugneret, R. Berger, O. Azogui. 1993. Molecular analysis of T cell receptor transcripts in a human T cell leukemia bearing a t(1;14) and an inv(7); cell surface expression of a TCR-β chain in the absence of α chain. Leukemia 7: 1645-1653. Kojis, T. L., R. A. Gatti, R. S. Sparkes. 1991. The cytogenetics of ataxia telangiectasia. Cancer Genet. Cytogenet. 56: 143-156. Aster, J. C., J. Sklar. 1992. Interallelic V(D)J trans-rearrangement within the β T cell receptor gene is infrequent and occurs preferentially during attempted Dβ to Jβ joining. J. Exp. Med. 175: 1773-1782. Lopes, L. F., F. S. Piccoli, V. A. Paixao, M. R. Latorre, B. Camargo, A. J. Simpson, O. L. Caballero. 2004. Association of CYP3A4 genotype with detection of Vγ/Jβ trans-rearrangements in the peripheral blood leukocytes of pediatric cancer patients undergoing chemotherapy for ALL. Leukemia Res. 28: 1281-1286. Tycko, B., J. D. Palmer, J. Sklar. 1989. T cell receptor gene trans-rearrangements: chimeric γ-δ genes in normal lymphoid tissues. Science 245: 1242-1246. Vanasse, G. J., J. Halbrook, S. Thomas, A. Burgess, M. F. Hoekstra, C. M. Disteche, D. M. Willerford. 1999. Genetic pathway to recurrent chromosome translocations in murine lymphoma involves V(D)J recombinase. J. Clin. Invest. 103: 1669-1675. Tycko, B., H. Coyle, J. Sklar. 1991. Chimeric γ-δ signal joints. Implications for the mechanism and regulation of T cell receptor gene rearrangement. J. Immunol. 147: 705-713. Raghavan, S. C., I. R. Kirsch, M. R. Lieber. 2001. Analysis of the V(D)J recombination efficiency at lymphoid chromosomal translocation breakpoints. J. Biol. Chem. 276: 29126-29133. Takata, M., M. S. Sasaki, E. Sonoda, C. Morrison, M. Hashimoto, H. Utsumi, Y. Yamaguchi-Iwai, A. Shinohara, S. Takeda. 1998. Homologous recombination and non-homologous end-joining pathways of DNA double-strand break repair have overlapping roles in the maintenance of chromosomal integrity in vertebrate cells. EMBO J. 17: 5497-5508. Han, J. O., L. A. Erskine, M. M. Purugganan, T. D. Stamato, D. B. Roth. 1998. V(D)J recombination intermediates and non-standard products in XRCC4-deficient cells. Nucleic Acids Res. 26: 3769-3775. Kulesza, P., M. R. Lieber. 1998. DNA-PK is essential only for coding joint formation in V(D)J recombination. Nucleic Acids Res. 26: 3944-3948. Lieber, M. R., J. E. Hesse, S. Lewis, G. C. Bosma, N. Rosenberg, K. Mizuuchi, M. J. Bosma, M. Gellert. 1988. The defect in murine severe combined immune deficiency: joining of signal sequences but not coding segments in V(D)J recombination. Cell 55: 7-16. Tevelev, A., D. G. Schatz. 2000. Intermolecular V(D)J recombination. J. Biol. Chem. 275: 8341-8348. Retière, C., F. Halary, M. A. Peyrat, F. Le Deist, M. Bonneville, M. M. Hallet. 1999. The mechanism of chromosome 7 inversion in human lymphocytes expressing chimeric γβ TCR. J. Immunol. 162: 903-910. Gottlieb, T. M., S. P. Jackson. 1993. The DNA-dependent protein kinase: requirement for DNA ends and association with Ku antigen. Cell 72: 131-142. Shiloh, Y.. 1997. Ataxia-telangiectasia and the Nijmegen breakage syndrome: related disorders but genes apart. Annu. Rev. Genet. 31: 635-662. Morales, M., J. W. Theunissen, C. F. Kim, R. Kitagawa, M. B. Kastan, J. H. Petrini. 2005. The Rad50S allele promotes ATM-dependent DNA damage responses and suppresses ATM deficiency: implications for the Mre11 complex as a DNA damage sensor. Genes Dev. 19: 3043-3054. Livák., F.. 2006. In vitro and in vivo studies on the generation of the primary T cell receptor repertoire. Immunol. Rev. 200: 23-15. Boultwood, J.. 2001. Ataxia telangiectasia gene mutation in leukaemia and lymphoma. J. Clin. Pathol. 54: 512-516. Gumy-Pause, F., P. Wacker, A. P. Sappino. 2004. ATM gene and lymphoid malignancy. Leukemia 18: 238-242. Elson, A., Y. Wang, C. J. Daugherty, C. C. Morton, F. Zhou, J. Campos-Torres, P. Leder. 1996. Pleiotropic defects in ataxia-telangiectasiaprotein-deficient mice. Proc. Natl. Acad. Sci. USA 93: 13084-13089. Williams, B. R., O. K. Mirzoeva, W. F. Morgan, J. Lin, W. Dunnick, J. H. Petrini. 2002. A murine model of Nijmegen breakage syndrome. Curr. Biol. 12: 648-653. Abdallah, J. M., D. P. Lombardi, I. R. Kirsch. 1995. Genetic instability in patients with Hodgkin’s disease undergoing chemotherapy. J. Clin. Invest. 96: 2744-2747. Lopes, L. F., E. D. Neto, I. Lorand-Metze, M. R. D. O. Latorre, A. J. G. Simpson. 2001. Analysis of Vγ/Jβ trans-rearrangements paediatric patients undergoing chemotherapy. Br. J. Haematol. 113: 1001-1008. Zhu, C., M. A. Bogue, D. B. Roth. 1996. Thymocyte differentiation in γ-irradiated severe-combined immunodeficient mice: characterization of intermediates and products of V(D)J recombination at the T cell receptor α locus. Eur. J. Immunol. 26: 2859-2865. Rooney, S., J. Sekiguchi, C. Zhu, H. L. Cheng, J. Manis, S. Whitlow, J. DeVido, D. Foy, J. Chaudhuri, D. Lombard, F. W. Alt. 2002. Leaky Scid phenotype associated with defective V(D)J coding end processing in Artemis-deficient mice. Mol. Cell 10: 1379-1390. Brown, M. L., Y. Chang. 2000. Metabolism of recombination coding ends in scid cells. J. Immunol. 164: 4135-4142. Blunt, T., N. J. Finnie, G. E. Taccioli, G. C. Smith, J. Demengeot, T. M. Gottlieb, R. Mizuta, A. J. Varghese, F. W. Alt, P. A. Jeggo, S. P. Jackson. 1995. Defective DNA-dependent protein kinase activity is linked to V(D)J recombination and DNA repair defects associated with the murine scid mutation. Cell 80: 813-823. Lista, F., V. Bertness, C. J. Guidos, J. S. Danska, I. R. Kirsch. 1997. The absolute number of trans-rearrangements between the TCRG and TCRB loci is predictive of lymphoma risk: a severe combined immune deficiency (SCID) murine model. Cancer Res. 57: 4408-4413. Rabbitts, T. H.. 1994. Chromosomal translocations in human cancer. Nature 372: 143-149. McBride, W. H., C. S. Chiang, J. L. Olson, C. C. Wang, J. H. Hong, F. Pajonk, G. J. Dougherty, K. S. Iwamoto, M. Pervan, Y. P. Liao. 2004. A sense of danger from radiation. Radiat. Res. 162: 1-19. Chen, C. L., J. C. Fuscoe, Q. Liu, M. V. Relling. 1996. Etoposide causes illegitimate V(D)J recombination in human lymphoid leukemic cells. Blood 88: 2210-2218. Hecht, F., B. K. Hecht, I. R. Kirsch. 1987. Fragile sites limited to lymphocytes: molecular recombination and malignancy. Cancer Genet. Cytogenet 26: 95-104. Aurias, A., J. Couturier, A. M. Dutrillaux, B. Dutrillaux, F. Herpin, E. Lamoliatte, M. Lombard, M. Muleris, M. Paravatou, M. Prieur, et al 1985. Inversion (14)(q12qter) or (q11.2q32.3): the most frequently acquired rearrangement in lymphocytes. Hum. Genet. 71: 19-21. Kirsch, I. R., F. Lista. 1996. Transrearrangements as biomarkers for risk of lymphoid malignancy. Cancer Surv. 28: 311-327. Lipkowitz, S., V. F. Garry, I. R. Kirsch. 1992. Interlocus V-J recombination measures genomic instability in agriculture workers at risk for lymphoid malignancies. Proc. Natl. Acad. Sci. USA 89: 5301-5305. Meydan, D., B. Lambert, D. Hellgren. 1997. Frequency and cell specificity of T cell receptor interlocus recombination in human cells. Environ. Mol. Mutagen. 30: 245-253. Marrack, P., J. Kappler. 1990. The staphylococcal enterotoxins and their relatives. Science 248: 705-711. Rust, C. J., F. Verreck, H. Vietor, F. Koning. 1990. Specific recognition of staphylococcal enterotoxin A by human T cells bearing receptors with the Vγ9 region. Nature 346: 572-574. Giovannetti, A., F. Mazzetta, E. Caprini, A. Aiuti, M. Marziali, M. Pierdominici, A. Cossarizza, L. Chessa, E. Scala, I. Quinti, et al 2002. Skewed T cell receptor repertoire, decreased thymic output, and predominance of terminally differentiated T cells in ataxia telangiectasia. Blood 100: 4082-4089. Ossendorp, F., H. Jacobs, G. van der Horst, E. de Vries, A. Berns, J. Borst. 1992. T cell receptor-αβ lacking the β-chain V domain can be expressed at the cell surface but prohibits T cell maturation. J. Immunol. 148: 3714-3722. Liao, M. J., T. Van Dyke. 1999. Critical role for Atm in suppressing V(D)J recombination-driven thymic lymphoma. Genes Dev. 13: 1246-1250. Bosma, M. J., A. M. Carroll. 1991. The SCID mouse mutant: definition, characterization, and potential uses. Annu. Rev. Immunol. 9: 323-350. Lauritsen, J. P., M. C. Haks, J. M. Lefebvre, D. J. Kappes, D. L. West. 2006. Recent insights into the signals that control αβ/γδ-lineage fate. Immunol. Rev. 209: 176-190. Passoni, L., E. S. Hoffman, S. Kim, T. Crompton, W. Pao, M. Q. Dong, M. J. Owen, A. C. Hayday. 1997. Intrathymic δ selection events in γδ cell development. Immunity 7: 83-95.